Ladies. If you haven’t already, meet George. George is the brilliant mastermind / chef / photographer behind Civilized Caveman Cooking Creations. He also happens to be one of my most dear friends, and one of the most open and outspoken advocates of body love in the paleo world. He struggled with body image and with bulimia for many years, and while a Marine, to boot. After Crossfitting for some time and going paleo, George found real health. He found allegiance to his body. He found radical, permanent self-love. You can listen to his story on my podcast here, or read it in his own words at his blog here. George makes food. But he doesn’t just make it. He creates it. He loves it. He perfects it. It’s always an enormous honor to be in his kitchen (helllooo paleo fx 2014!). 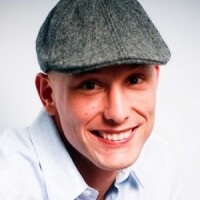 He’s been blogging food and making apps and producing ebooks for years and years now, and is a pro. 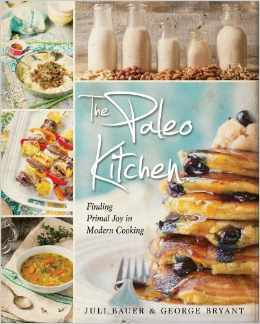 And now, finally, he has joined up with the wickedly brilliant and beautiful Juli Bauer of PaleOMG to produce a hardcover, Barnes and Noble-esque cookbook called The Paleo Kitchen. This book can be pre-ordered now, here, and I could not recommend it more highly. T’will be delivered June 10, 2014. An all-expenses paid weekend hangout with the three of them. A 2 night, 3 day trip to San Diego all expenses paid to hang out with us. We will go shopping for food, cook up a storm, do some sightseeing and Crossfit if you want. 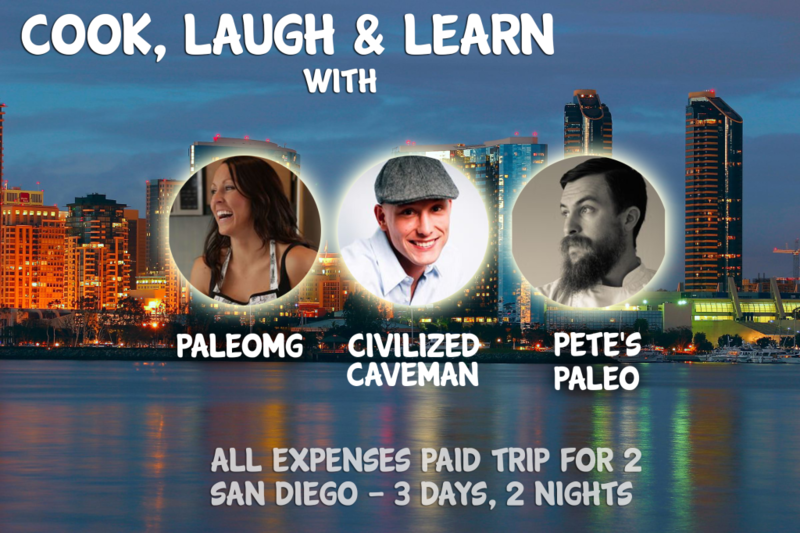 We will also be hanging out with the amazing Pete from Pete’s Paleo who will be teaching all of us how to shop at a farmers market, picking the freshest ingredients and developing a menu around them. Pretty much, we want to make sure whoever wins has the best 3 days of their lives in San Diego and we eat lots of food with lots of laughs. You even get to bring a friend. All you have to do to enter is to pre-order the book from Amazon and tell George you did so @ here. 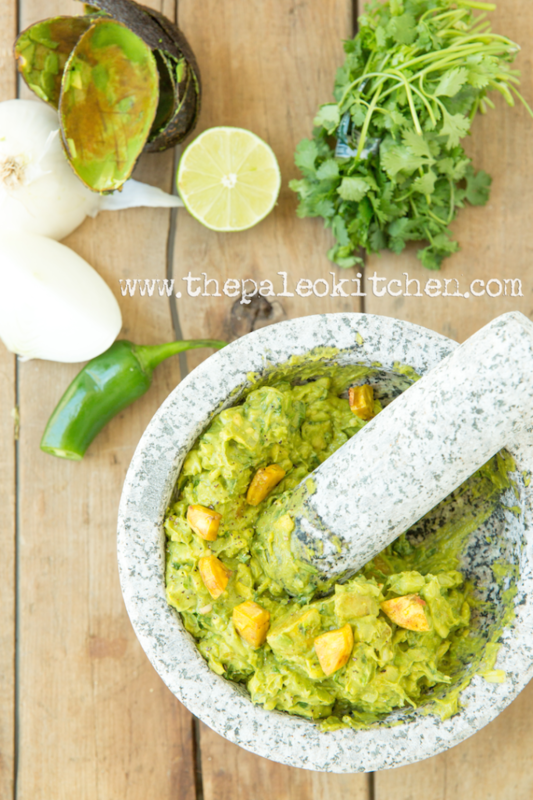 So in celebration of the book and because George is kind enough to entertain my begging, he has shared his infamous Sweet Plantain Guacamole with me here to share with you. Place a small skillet over medium heat and add the coconut oil. Once the coconut oil is hot, add half of the garlic to the pan along with diced plantain. When the plantain dice begin to brown, salt them, and then flip to brown on other side. from the heat and let cool. George. 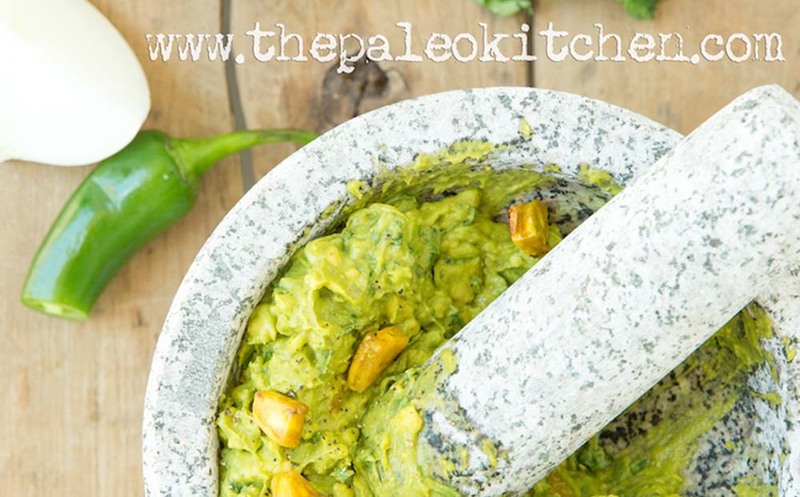 The Paleo Kitchen. Epic Giveaway for a weekend of learning and cooking and hanging with George, Juli, and Pete at George’s blog. Ends April 9!